The purpose of this distinguished book series is to describe the structure and functioning of all major types of ecosystem, whether aquatic or terrestrial, natural or subject to human influence - in some cases virtually man-made (like greenhouses, fishponds, or intensive animal production). 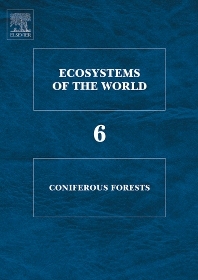 The subjects covered by Ecosystems Of The World are divided by ecosystem types or biomes, so that each volume covers that type on a world-wide basis. For each volume, one or more specialists in the field have been appointed as editors, and they in turn have assembled specialist writers from all around the world to contribute chapters. The result is a series of volumes that will serve as a basic source of ecological knowledge and reference for many years. Each volume contains high quality subject, species and author indexes for ease of reference. Ecosystems of the World will appeal to biologists, ecologists, conservationists and land managers throughout the world. This volume Coniferous Forests is the last in the series Ecosystem of the World. Conifers and coniferous forests are an important element around us and attract our interest. This volume starts with an account of the history and distribution of the conifers. In six chapters the most important areas in Asia, Europe, North and South America with conifers forest are described covering boreal, temperate, tropical as well as mountainous regions. The descriptions are made out from a biome and an ecosystem perspective. Also detailed accounts on tree species other vegetation is also briefly described. Climatic and soil conditions are dealt with as well as disturbances. Interesting notes on vegetation classification is also to be found, among others from Russia. The functional aspects of the conifer forests in terms of physiology, production, biomass, water and elemental cycling are dealt with in four chapters. Applied aspects as their economic value, management and importance for tourism are also presented.